After reading the story of the Salmon of Knowledge, Rose asked if Fionn could taste the salmon in the small drop of oil that burned his thumb. The myth does not speak of any particular sensations Fionn experienced, but does say that Fineagas noticed a change in Fionn’s appearance and immediately knew that the special knowledge of the salmon had been given to him. There are many versions of this classic Irish folktale, but in each a brave leader (Fionn) goes in search of wisdom in order to better serve his people (the Fianna). At the University of Notre Dame, our graduate students come seeking wisdom and knowledge, then go forth using those gifts for the benefit of people all over the world. The Salmon of Knowledge, therefore, is the perfect symbol of the common life journey shared by the diverse members of our graduate community. Why does a university founded by a French religious order have a leprechaun as its mascot? It didn’t always. Our sports teams have been known as the Ramblers, the Rovers, and the Irish Terriers. But an early association between Irish Immigrants and Catholicism led to a tradition of referring to anyone from Notre Dame as Irish. While the use of the Fighting Irish moniker dates back to the turn of the 20th century, the image of the leprechaun with fists up ready to fight, was only adopted as the official mascot in 1965. 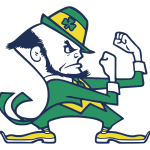 The leprechaun logo is typically only used in conjunction with the University’s athletics teams and not with the academic programs.